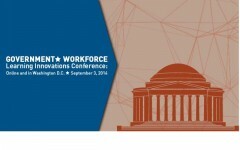 Join local, state and federal learning professionals on September 3, 2014 for the Association for Talent Development(ATD, formerly ASTD) conference, Government Workforce: Learning Innovations. ATD has partnered with government subject matter experts to create a conference agenda that reflects today’s challenges. Katherine Archuleta, the director of the Office of Personnel Management (OPM), will provide the opening keynote address. She will address President Barack Obama’s vision for the federal workforce and elaborate on her own vision for workplace learning and development. Learn from recognized government subject matter experts as they tackle some of the major issues impacting government today. Benchmark your learning and development practices against leading agencies. Approved as training in compliance with 5 U.S.C. Chapter 41 by OPM. Check out the agenda page to review all the speakers and sessions descriptions for Government Workforce. Register today!